Has Your TEA Party Group Been Co-opted By the Michigan Republican Party? I received an email titled “Monroe Republicans Events” from the Patriots of Southeast Michigan and when I replied to inquire why they were sending out events promoting a liberal Richardville group of Republicans I received this reply below. I post information, not necessarily endorsing it. If any true conservatives have the courage to participate and try to influence Monroe Republicans, more power to them.~ Sara. The stated mission of this group is as follows: Patriots of Southeast Michigan is a “non-partisan” group dedicated to holding elected officials accountable to the Constitution and to sharing information and tools to support, encourage, and connect like-minded citizens. 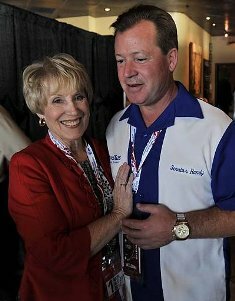 For those unaware Glenda Kennon is Senator Randy Richardville’s mother. Below is the email I received and below that is an email Glenda sent out advocating “planned parenthood” also of note both Glenda Kennon and Randy Richardville sit on the Monroe Right to Life board. We have a new 7th Congressional District Field Director. [See attached bio.] I would like to welcome Richard Fair to Monroe. He has a very interesting “story” to tell. I especially like the part where he was raised Democrat and one day went through his beliefs and realized, he was a Republican. Richard Fair will be our guest speaker. [Bio attached.] Come early so you can meet and talk with him and he will be speaking about 15 minutes before our regular business meeting. I would assume it will be a short meeting since Voting starts Tuesday August 5th. Bright and early. MAKE SURE EVERYONE GOES OUT AND VOTES. FAMILY, NEIGHBORS, FRIENDS. Offer to give them a ride if necessary. THAT IS THE ONLY WAY OUR CANDIDATES WILL WIN. GET OUT THE VOTE, Tuesday August 5. Thursday: August 14th Monroe County Republican Convention. 7:00 p.m.
At the Monroe County Court House, County Commission Chambers. Bring a photo ID with you. I will have the final certified list of the Primary August 5th elected Precinct Delegates. Only those who were elected on August 5th can vote for the Delegates to attend the State Convention. Doors will open at 6:30 for registration. Wednesday: August 20th Fundraiser for Justice Brian Zahra and Justice David Viviano. See attachment (PDF) This is an important event we need to keep our Supreme Court conservative. Please purchase a ticket and bring friends as well. Saturday: August 23rd State Convention in Novi. Additional information will be emailed regarding any events on Friday night and hotel information if there is interest in coming up on Friday night as well The voting however, will be during the convention on Saturday a.m.
Thursday, September 25 Secretary of State Ruth Johnson will be the guest speaker for the Republican women’s luncheon Monroe Golf and Country Club. Additional information will be sent at a later date. *Patriots of Southeast Michigan is a non-partisan group dedicated to holding elected officials accountable to the Constitution and to sharing information and tools to support, encourage, and connect like-minded citizens. The email below is from Glenda Kennon first Vice Chair of the Monroe County Republican Party. The email below illustrates our frustration with Republicans who approved our Sanctity of Life plank but defend Republican-In-Name-Only legislators who voted to fund the world’s largest abortion mill with our tax dollars. Barb, I would not call these 12 RHINO’s, personally I do not like this term, their total record, not just one vote, needs to be taken into account before the labeling happens. Planned Parenthood does a lot more than abortion; they also provide different methods of birth control, counseling, STD’s prevention and treatment and much more. Abortion, adoption and other options are also supplied to the expectant mother instead of just abortion. If you read more that just what this one person has to say about this issue, you might be surprised what PP actually does. It also helps the mothers who want to keep their baby and provide clothing and supplies for them etc. Sometimes pharmacy companies donate cases of formula. They provide Teaching and hospital options, midwife as well as ensuring that the expectant mother receives adequate prenatal care, vitamins etc. Get the expectant mother in touch with social services and welfare as well as programs to help with the medical care and food for the baby for only $5.00 a month. They actually help them fill out the forms. I would hold judgment until more information was provided. Our social workers work very closely with Planned Parenthood and the health department. It is NOT just about abortion. Go on the web and look up Planned Parenthood and read the additional information regarding this issue. The TEA Party was NEVER meant to be wings of the Republican Party to rubber stamp it’s WEAK candidates in November! Wake up people! ← Wackobirds of a Feather Frolic together. Sure they will promote volunteering for 'Victory Centers" and running for Precinct Delegates. Sure they will have people speaking on behalf of republicans. One of Jack Brandenburg staff is a semi-regular attendee of MEDEFCO Meetings. Several Oakland County Republicans have been to Troy Area Tea Party Meetings. Have they tried dispensing the kool aid. But in defense to the caliber of people attending the local Tea Party Meetings, there have also been a number of people speaking out against republicans who have gone against their own party's clearly stated principles (i.e. Obamacare & Common Core...just to name a few). OABTW, I'd love to find out where Mrs. Kennon gets her info about PP. The last time I swung by a PP locations NONE of what she said was being promoted.